The start of another crazy week! We have had a very mild winter here in Johannesburg with a lot of lovely sunny days. Friday and Saturday were really rather gloomy though - dull grey skies and relatively cold - we spent most of the time indoors. I thought winter had finally arrived but we awoke to wonderful sunshine again yesterday and today! I finished pruning the last of the roses on Tuesday (I don't allow anyone else to touch the Roses - did all the pruning myself so my hands are quite sore! - not to mention my back!) I am thinking that I might have pruned a bit too early as I see my favorite Rose Farm is only starting their pruning today! I used about 75g of each of cream, lilac, light grey and cornflower blue DK and about 100g of baby blue. Also used about 50g of Elle Marble in the palest blue - unfortunately there was none left for the photo! The above photo's were taken of another project (a cushion cover) - but you can see how easy it is to get this going! Play around with colours for different effects. I used a "running chain" in lilac to finish it off! Off to do some chores (YAY!) and then I will try to post the banana tea loaf recipe! I love this afghan. You do beautiful work and your color selection/placemennt is amazing. I love color. I was wondering about the "running stitch" I have not heard that term used before in Crochet and the photo does not give detail. Would this be similar to a row of single crochet around the outside edge. Thank you. Hi Dorie. The edging is actually more of a braid. 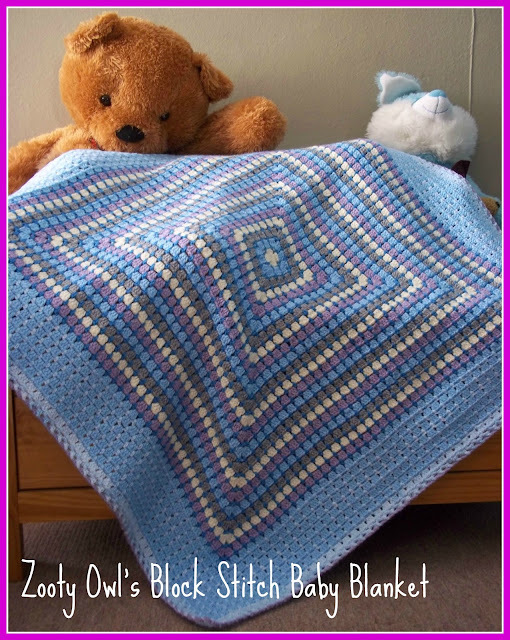 Go and have a look at my "Road Trip Scarf" pattern - I use the same edging there. 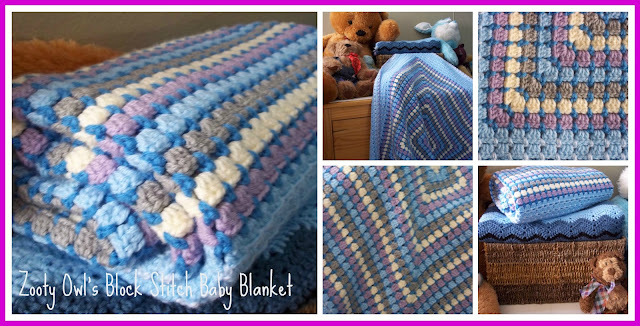 I love your box stitch blankets - I was quite happy when I came across your blog as this was a stitch one did not see much of. There seems to have been a bit of a revival though - I have seen it popping up all over now! !